Ladies and Gentleman! Announcing the ultimate Blueberry muffin! So moist, delicious and full of blueberry flavor in every bite, you’ll gobble them up faster than you can say supercalifragilisticexpialidocious! I prefer fresh when the budget will allow. The quick berry jam that you’ll cook is then swirled around in the batter to ensure sweet berry flavor in every bite. Top the muffin batter off with a lemon sugar streusel and you have perfection. I love the way the tart bright flavor of lemon balances the sweetness of the cooked blueberries. Buttermilk is used in the batter to help give a really nice bit of tartness, and again works to balance the sweet flavor of the berries. I have talked about making your own substitute buttermilk at home in previous recipes. Do not use the substitute for this recipe, or your muffins will be dry. You’ll need to use store-bought buttermilk this time. Over-mixing this batter can be a real downer. Literally. If you mix it too much before baking, too much gluten will form from the flour and inhibit the rising in the oven during baking time. 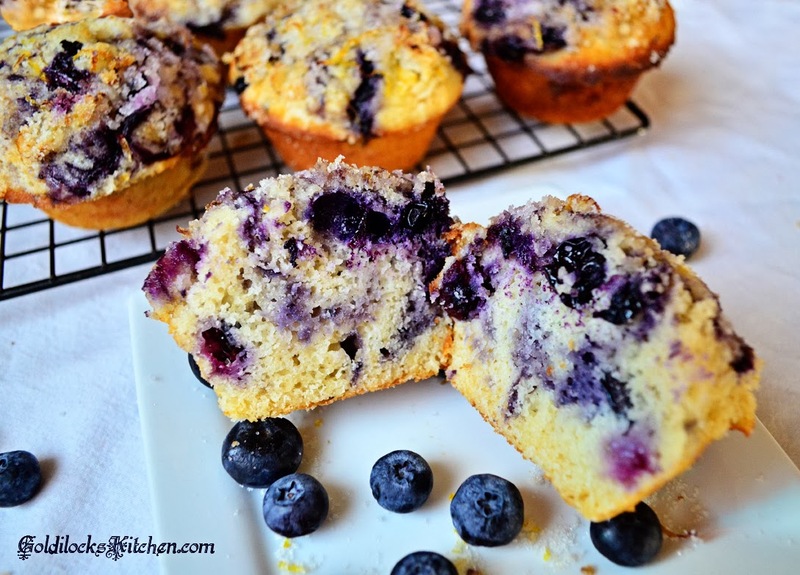 If you want your muffins light, moist and airy, be careful when mixing the berries and flour into the batter. You’ll want to see a few small streaks of white flour remaining. Don’t worry, as the muffins rise and cook in the oven the flour will be moistened and incorporate into the muffin just fine. 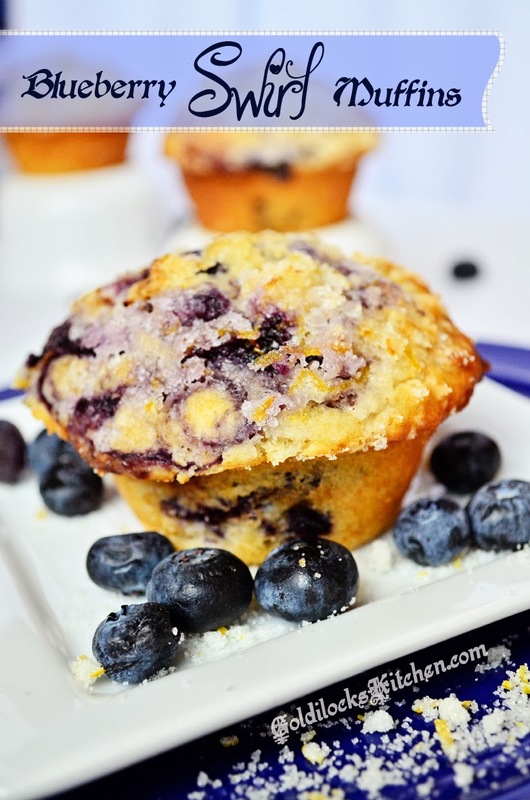 So here it is, the recipe for the best blueberry swirl muffins! This Blueberry Swirl muffin recipe is the perfect combination of fluffy moist cake and blueberry filling swirled inside. Made even better with a lemon streusel topping. Stir together the lemon zest and the sugar in a small bowl and set aside. Set your oven to heat at 425 and move an oven rack to the upper-middle position. Spray your muffin tin with cooking spray. Measure out the sugar. Scoop one heaping teaspoon of sugar out and put it in a small saucepan. Add 1 cup of blueberries to the sauce pan and place it over medium heat. Bring to a simmer, stirring and mashing the berries with a spoon until the berries are all broken and the mixture is thickened and reduced to approximately 1/3 cup jam. Remove from heat and continue with the recipe while it cools. Whisk the flour, baking powder, and salt together in a large mixing bowl. In a medium bowl, whisk the remaining sugar and the eggs together until thick and well mixed. Slowly whisk in the butter and oil, followed by the buttermilk and vanilla. Using a rubber spatula, fold the egg mixture and remaining 1 cup blueberries into the flour mixture until just moistened. The batter should be very lumpy with a few white streaks of flour. Don't overmix. With a 1/3 measuring cup or an ice cream scoop, divide the batter evenly among the twelve cups in the muffin tin. The batter should completely fill the cups. Spoon 1 teaspoon of the jam mixture into the center of each muffin. Using a skewer or toothpick, gently swirl the batter around back and forth about 4 or five times. You just want to swirl the jam around in the batter, not mix it together. Sprinkle the lemon streusel on top and place the muffin tin in the oven for 17 minutes, rotating the pan half way through baking. Cool the muffins in the pan for 5 minutes, then remove to finish cooling on a wire rack. I like to use a good pair of tongs to get the muffins out easily. Run a knife around the edges first. Blissful Joy, those are so yummy!!! So glad you enjoy them as much as I do :0) Thanks for the feedback!